Mass spectrometry library based compound identification is a well known and widely used identification process for mass spectra measured using Electron Ionization (EI). The library software calculates a score or "matching factor" for each of the many pre-recorded library EI mass spectra, and then assigns each of them an "identification probability". High matching factors are given to mass spectra which are similar to the analyzed mass spectrum and are therefore good identification candidates. The assigned identification probabilities are analysis-specific as they are calculated after taking into account all generated matching factors [1-3]. This means that having a good matching factor for a certain library mass spectrum is not enough to give it a high identification probability and a high ranking in the identification hit list. To obtain such a high identification probability which is considered as a good identification of the analyzed compound, the analysis must produce one library spectrum with a matching factor which is relatively higher than that of all others . Cold EI is the electron ionization of vibrationally cold molecules in supersonic molecular beams (SMB) [4-6]. Cold EI typically provides mass spectra with all the standard EI fragment ions combined with enhanced molecular ions and slightly enhanced high mass fragments [4-6]. In Cold EI, the reduced amount of intra-ion vibrational energy results in the reduction of low mass fragment ions abundances that increase the population of higher mass ions. However, most fragment ions are only slightly affected in their relative abundance since they are in a steady state in which the vibrational cooling in SMB increases their relative abundance due to contribution from lower mass fragments while decreasing their relative abundance due to their contribution to the relative abundance of higher mass fragments. On the other hand, the molecular ion is unique in that it only obtains relative abundance from lower mass fragments hence its relative abundance is significantly increased while high mass fragments are only slightly enhanced. Despite the differences between Cold EI mass spectra and standard EI mass spectra we found that in most cases sample compound library identification actually improves with Cold EI, as library identification probabilities for the correct library mass spectra are increased along with the lowering of the matching factor [7, 8]. In 2002 Kochman et. al. compared library identification results of 13 pesticides whose mass spectra were obtained with standard EI and Cold EI. As shown and discussed in that article, for ten out of the 13 pesticides the Cold EI mass spectra provided higher identification probabilities (for the correct library compound) than that which was provided by standard EI while for three pesticides the identification probabilities were similar or marginally better for standard EI. On the other hand, the matching factors were higher for 11 pesticides in standard EI and only in two pesticides Cold EI provided higher matching factors. The conclusion of that research was that the enhanced molecular ions of Cold EI actually improves the NIST library based identification probabilities while providing additional confirmation of the identification via the availability of the correct molecular ion that is often missing or weak in standard EI. Figure 1 shows the standard EI and Cold EI mass spectra of the insecticide Dimethoate. The molecular ion at m/z=229 can be seen on both mass spectra. 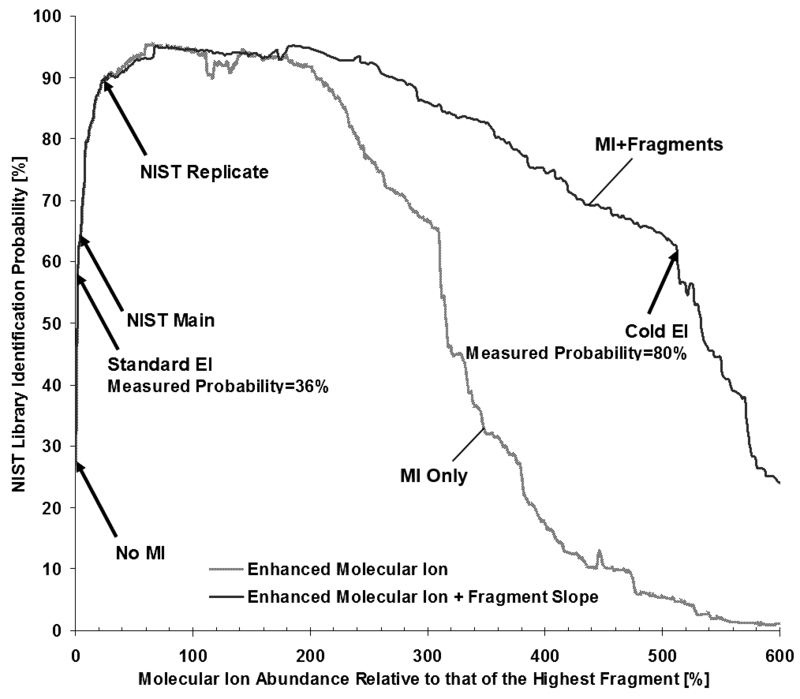 Cold-EI provides an abundant molecular ion and enriched high mass fragments (m/z=125 fragment is higher than the m/z=93 fragment, unlike in standard EI) while the low mass spectral fragments are somewhat depleted. 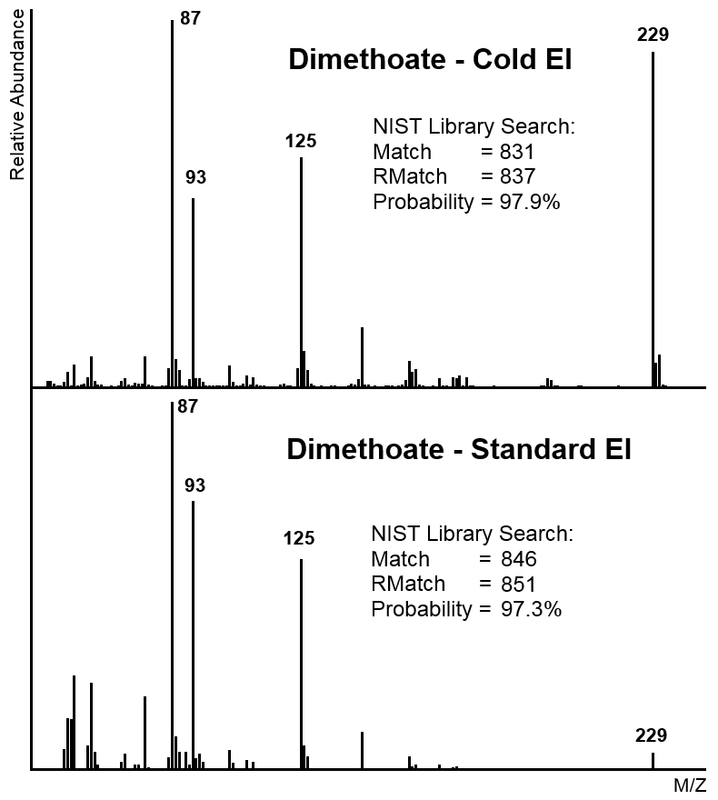 As can be seen in figure 1, the standard EI mass spectrum is more similar to the Dimethoate mass spectra (main lib and replica) stored in the NIST MS Library and as a result its match factor and reversed match factor are higher than those of the Cold-EI mass spectrum. Nevertheless, the identification probability is higher for the Cold EI mass spectrum than for standard EI mass spectrum (97.9% vs 97.3%). The enhancement of the relative abundance of the Dimethoate molecular ion provided by Cold-EI (over 20 times higher) lowers the matching factor as it makes it less similar to the same compound's library mass spectra (main lib and replicates). Fortunately (for Cold EI) the same enhancement also lowers the match factors of all other library mass spectra even more since high mass ions, and especially the molecular ion, characterize a compound more than low mass ions and therefore carry more weight in library search identification algorithms. As a result, the identification probability for the correct compound is increased with Cold EI. Figure 1 – Mass spectra of Dimethoate measured with a GC-MS with standard EI (lower trace) and with a GC-MS with Cold-EI (upper trace). The molecular ion's relative abundance is highly enriched in the Cold-EI spectrum (91.3% vs. the standard's 4.3%). The library identification probability is higher for the Cold-EI mass spectrum even though it has a lower match. This paper deals with several questions which arise from this 'Lower Fit but Better Hit' behavior: Can this increase in identification probability be attributed to the enhancement of the molecular ion itself? How do the enhanced high mass fragments affect this behavior? How much enhancement is desirable to obtain the highest identification probability? A special software was developed to facilitate the manipulation and testing of mass spectra files. The software takes any original mass spectrum (Agilent Chemstation and NIST mass spectra were used), changes the abundances of the various ions, sends the new modified mass spectrum to be analyzed by the NIST MS Library search software and then collects and saves the library results (matching factors and identification probabilities). To understand how the size of the molecular ion itself affects library identification results, the software was used to manipulate several standard EI mass spectra, producing various molecular ions Relative Abundances (RA) (including all isotopomers) without changing the abundances of any fragment ion. The molecular ion abundances were set from 0% (no molecular ions at all) and up to and beyond the abundances which are provided by Cold-EI. To test the effect of high mass fragment enhancement on library identification results, the software was also used to enhance both the molecular ion and high mass fragments, mimicking the way Cold-EI affects the mass spectra. The molecular ion's abundance was gradually increased as before, and a linear enrichment slope was applied to all other fragments so that high masses were enriched while low masses were not (so that their relative abundances were actually lowered). In these simulations the enrichment of high mass fragments was significantly lower than that of the molecular ions (up to about 20% of the molecular ion enhancement factor). In order to verify and show that the simulation results depict the general behavior of real measured mass spectra, the actual mass spectra of each compound was taken with standard EI and Cold-EI. Agilent model 5975 was used for obtaining standard EI (Agilent Technologies, Santa Clara CA) and the Aviv Analytical 5975-SMB GC-MS with Cold-EI (Aviv Analytical LTD, Tel Aviv Israel) for Cold EI MS. In addition, the EI mass spectra stored in the NIST MS library were also used as a reference. The EI mass Spectrum of Dimethoate was analyzed by the NIST MS Library after it was manipulated to have various molecular ion abundances. At first, the abundance of the molecular ion was set at 0% and the spectrum was analyzed by the library yielding an identification probability of 94%. Then the abundances of the molecular ion group (MI, MI+1 and all other isotopomers) were raised together in small increments while keeping the same relative abundances between them. After each such increment the new modified mass spectrum was again analyzed by the library. The results of these tests are presented by the gray curve plotted in figure 2. Notice that as the relative abundance rises so does the identification probability, and it keeps rising even after the relative abundance is increased to be bigger than that of NIST's highest molecular ion replicate mass spectrum (RA=14.4%) to peak at a relative abundance of ~27%. After this point the probability slowly decreases as the abundance is increased, but at relative abundance of 91.3% which is the actual relative abundance in the Cold-EI mass spectrum (see figure 1), the identification probability is still higher than that which was calculated for Standard EI. The black plot in figure 2 shows the results of another experiment in which the molecular ion of Dimethoate was increased in abundance in the range of 0-300% (just as before) and high mass fragments were enriched as well, using a linear enrichment slope (with up to about 20% of the molecular ion enrichment). The resulting identification probabilities at relative abundance above 100% were slightly higher than those produced by the manipulation of the molecular ion alone. The reason for this increase, which was observed for all other software tested compounds, is that while the molecular ion is the most sample unique and characteristic ion, other high mass fragment ions are also somewhat compound unique and can help in the correct sample identification. Increasing the relative abundance of the molecular ion over 100% without increasing the relative abundance of the high mass fragments results in the actual lowering of all other fragments including these high mass fragments. If however, the high mass fragments are enriched as well, this effect is reduced. The library gives more weight to the similarity of high mass peaks when it calculates the matching factor  and these fragments are enriched the most by the software simulation and Cold-EI, therefore these spectra tend to be more similar (higher match) to NIST mass spectra than those generated by enhancing the molecular ion alone. 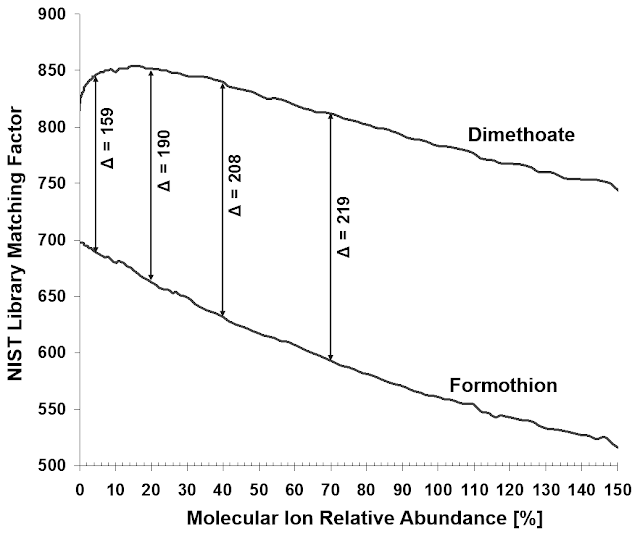 Figure 2 – NIST library identification probabilities dependence on the molecular ion relative abundance for Dimethoate. The grey curve considers only molecular ion abundance increase while the black curve shows how the enhanced abundances of Dimethoate's molecular ion and high mass fragments affect the library's identification probability (a more accurate representation of Cold EI mass spectra). The inserts describe cases of interest. Table 1 presents selected values found on the black plot in figure 2, at various points which are compared to real GC-MS measurements. The NIST library mass spectra were searched by the NIST library and naturally gave 999 matching factors while as shown in Table 1 their identification probabilities were not 100% due to high matching factors of competing non-Dimethoate compounds. Table 1 – Showing some interesting numbers located on the dark plot line in figure 2, including the library identification probability of Dimethoate after analyzing the software manipulated mass spectrum and a real measured mass spectrum at various relative abundance values. In both real and simulated data, Cold-EI provides improved library identification probabilities over Standard EI. A similar 'rise and fall' pattern can be seen in the identification probability provided for real measured spectra (right column of table 1) and both software simulated and measured data shows improved identification at higher Cold-EI level of relative abundance (better than Standard EI). In figure 3 the upper trace shows the matching factor of Dimethoate's mass spectrum as its molecular ion and high mass fragments are enhanced. As expected, the lack of any molecular ion provides a relatively low match as the library stored mass spectra include a few replicate mass spectra with 7.6-14.4% molecular ion. The matching score rises as the relative abundance of the molecular ion is increased, but after passing the library’s maximum relative abundance the match decreases and it exhibits a downward slope from here on. To demonstrate how this behavior coincides with the increased identification probability shown before, figure 3 includes a trace showing the matching factor of Formothion. Formothion ranks as number 2 in the NIST library hit-list since its mass spectrum is similar to the measured mass spectrum of Dimethoate, but as the relative abundance of the measured molecular ion increases its matching factor decreases more rapidly than that of Dimethoate since its molecular ion is different. As can be seen in figure 3 the distance between the matching factors of these two competing library mass spectra increases with the size of the molecular ion, which explains why the identification probability for Dimethoate actually grows. Figure 3 – Matching factors of Dimethoate and Formothion (NIST library #2 identification candidate) plotted versus the molecular ion relative abundances. As the simulated molecular ion abundance increases, the spectrum's similarity to both library spectra decreases, but the match of the 'correct' mass spectrum of Dimethoate decreases less than that of the 'wrong' mass spectrum of Formothion. This results in an increase of identification probability for Dimethoate. Figure 4 shows the standard EI and Cold EI mass spectra of the hydrocarbon Eicosane (n-C20H42) whose MI is at m/z=282 (small in the standard mass spectrum and highly enhanced in the Cold EI mass spectrum). Standard EI MS was obtained with an Agilent 5975C MSD, (Agilent Technologies Santa Clara CA) while Cold EI was obtained with the Aviv Analytical 5975-SMB GC-MS with Cold EI (Aviv Analytical LTD, Tel Aviv Israel). The standard EI mass spectrum was put to the same test described in section 2 above. As shown, despite the over 300 times increase in the molecular ion relative abundance in Cold EI (515%) versus standard EI (1.6%), the Cold EI identification probability of 80.2% is significantly higher than of standard EI which is 35.9%. 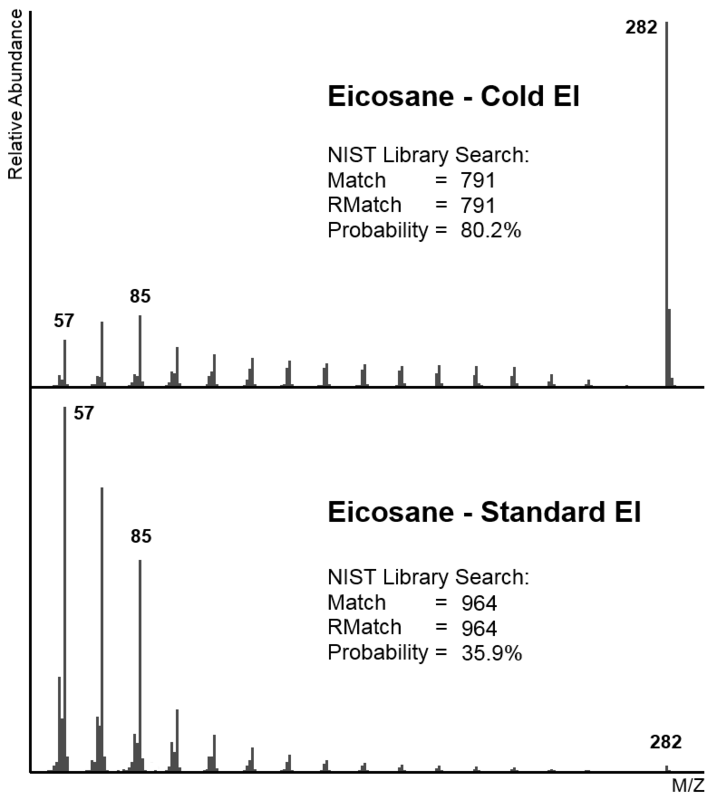 Figure 4 – Cold EI mass spectrum of Eicosane (n-C20H42) (upper MS) and its standard EI MS (lower MS) and their NIST library search results (inserts). 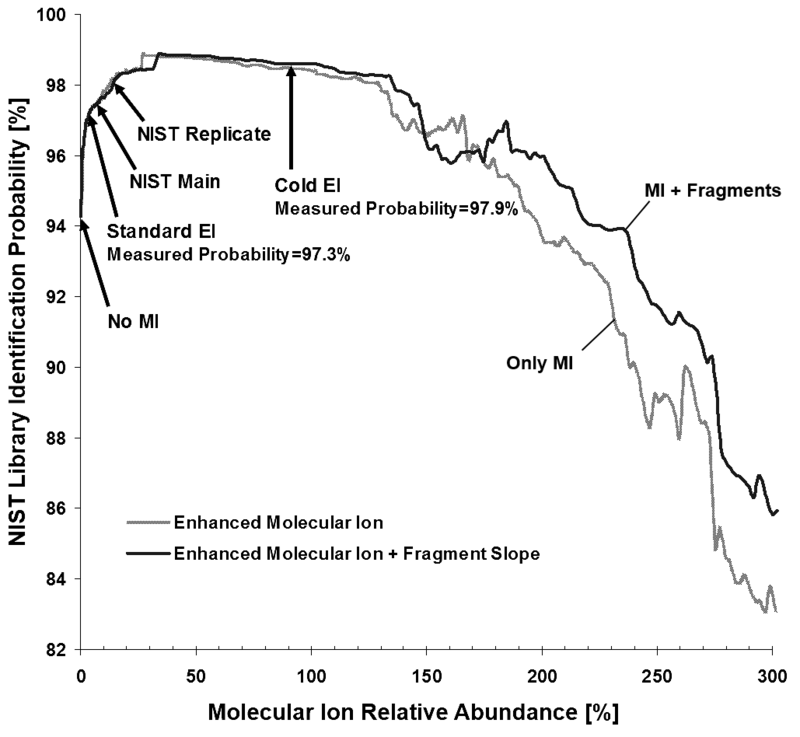 The molecular ion's abundance at m/z=282 is highly enriched in the Cold-EI spectrum (515% vs. the standard's 1.6%). The library identification probability is much higher for the Cold-EI mass spectrum even though it has a lower match. Figure 5 shows the results of molecular ion enrichment manipulation (gray line) and MI + fragments enrichment manipulation (dark line) for Eicosane. The different manipulated mass spectra were tested by the NIST MS library and the identification probabilities were plotted vs the relative abundance of the molecular ion. The same rise and fall behavior shown above for Dimethoate is demonstrated here as well, showing that a bigger molecular ion relative abundance produces better identification results but only up to a certain point from which the identification probability decreases. This graph shows the important contribution of the fragments enhancement, which decrease this downward slope and postponed it. The mass spectrum which was most similar to Cold-EI in terms of the relative abundance is already on the downwards slope of the black line due to the highly enhanced molecular ion and high mass fragments, but NIST still identifies it better (higher probability) than it does the standard EI mass spectrum. 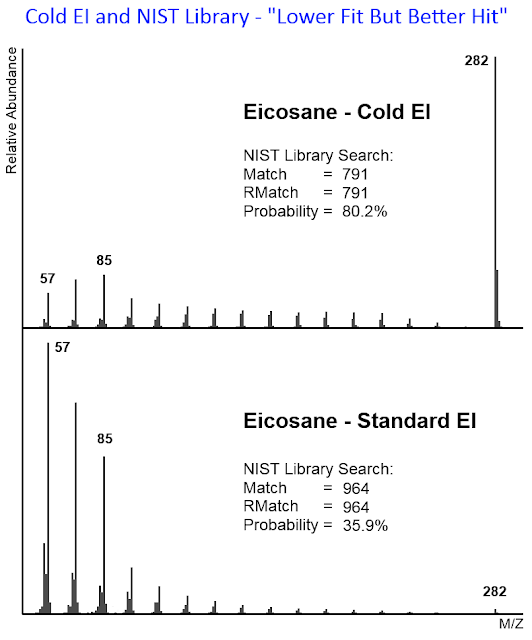 Figure 5 – NIST library identification probabilities dependence on the molecular ion relative abundance for Eicosane (n-C20H42). The grey curve considers only molecular ion abundance increase while the black curve shows how the relative abundances of Eicosane's molecular ion and fragments affects the library's identification probability (a more accurate representation of Cold EI mass spectra). As shown the library identification probability is higher for the Cold-EI mass spectrum even though it has a lower match. As can be seen in table 2 below, the downward slope provided by enhanced molecular ion in Cold-EI mass spectra in reality is much more moderate, giving the Cold-EI mass spectrum an impressive identification probability of 80.2% vs the 35.9% of Standard EI. Table 2 – Some interesting simulation and measurement numbers obtained from the black plot line in figure 5. In both real and simulated data, the identification is better when a Cold-EI mass spectrum is used instead of standard EI mass spectrum. We found that the enhancement of the molecular ions in Cold EI actually improves the NIST library identification probabilities in comparison with standard EI mass spectra, despite a decrease in the obtained matching factors. The computer simulations performed in this research provide better understanding of the 'lower fit but better hit' behavior demonstrated by Cold-EI [7, 8]. The matching of molecular ions enriched mass spectra are usually lower than that of standard EI mass spectra, but since the matching factors of other competing library mass spectra are lowered even more, the identification probability for the correct library mass spectrum actually increases. 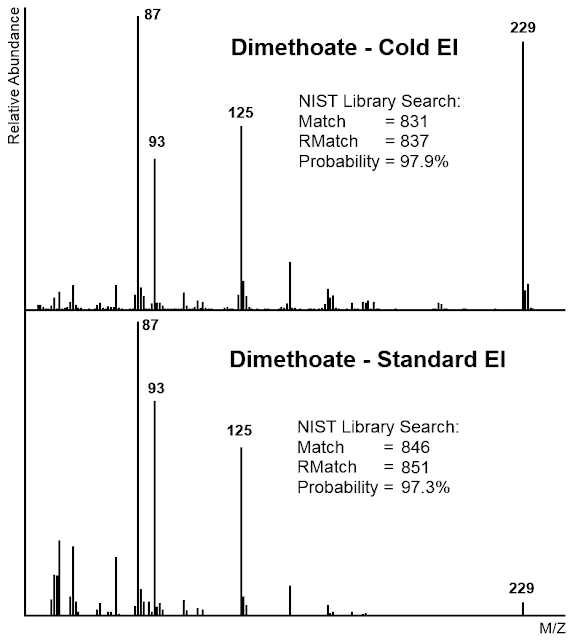 Thus, contrary to some perception, Cold EI actually improves library based sample identification. Furthermore, the trustworthy molecular ion in Cold EI mass spectra can, by itself, serve to confirm (or reject) library identification. In addition, the availability of abundant molecular ions serves for the provision of elemental formula with software such as the Tal-Aviv Molecule Identifier (TAMI) software that is based on isotope abundance analysis  and in consideration of limited quadrupole MS provided mass accuracy. Cold EI is also unique in enabling the user to obtain classical EI mass spectra via a simple method based reduction of the cooling helium make up gas flow rate. One can also use small helium make up gas flow rate to obtain slight cooling with relatively small enhancement of the molecular ion and this way we found that one can obtain a combination of best matching factors and very good identification probabilities . The enhancement of the molecular ion in Cold EI increases as the compound size is increased [4, 5, 10] due to increased compound heat capacity. For the same reason the molecular ion in standard EI is generally reduced with the compounds size (number of atoms) and thus, for the series of linear chain hydrocarbons the enhancement of the molecular ions in Cold EI is exponentially increased by about a factor of 1.2 (20%) per added carbon atom . We found that as the hydrocarbon size is increased the gain of Cold EI in library identification is typically increased and while standard EI mass spectra cannot be reliably identified by the NIST library at above C22 hydrocarbons sizes, in Cold EI they can be identified up to about C36. 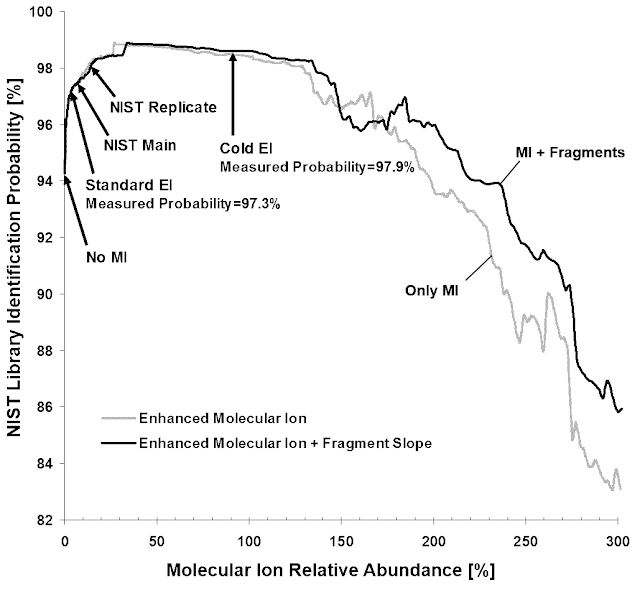 The enrichment of the molecular ion alone increases identification probability up until a certain relative abundance is reached (typically above 100%), after which further enrichment reduces it. Mass spectra with additional enrichment of high mass fragments, such as those provided by Cold-EI [4-6], provide higher identification probability even at higher enrichment levels. In fact, it was found that in some cases Cold EI mass spectra provide higher NIST library identification probabilities than can be achieved by the NIST library own mass spectra which naturally result in perfect 999 match and reversed match. Such NIST library search of its own mass spectra can be easily obtained in the following way; search a given compound EI mass spectrum and have its NIST library mass spectrum given in its own sub NIST search window, place the mouse on the NIST mass spectrum and right click will show "Library Search" at the upper list, mark it and click on it and you will obtain the NIST search of its own mass spectra. As can be seen, the match factors obtained this way are 999 but the probabilities of identification are lower than 100% since other competing compounds can have high matching factors as well. 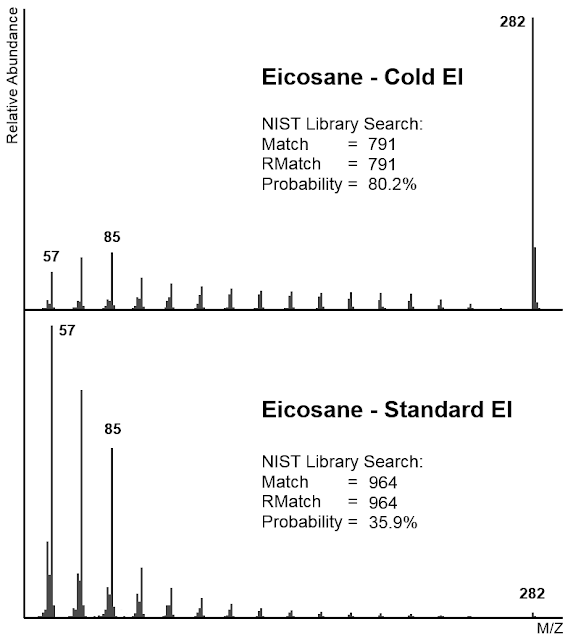 As an example, the Cold EI mass spectrum of Tricosane (n-C23H48) provides an identification probability of 84% while the NIST mass spectrum itself results in a lower identification probability of 77.4% and our experimental standard EI mass spectrum resulted in an identification probability lower than 7% as it was not in the first 5 candidates. Another example is the pesticide Diazinon which exhibits an identification probability of 92% with its Cold EI mass spectrum while the NIST mass spectrum provides an identification probability of only 87%. While such extreme cases are rare they serve to further support the claim that in Cold EI library searches one gets a "lower fit but better hit" and unlike any other method of soft ionization such as chemical ionization (CI), atmospheric pressure chemical ionization, photo ionization or field ionization, Cold EI uniquely provides a combination of enhanced molecular ions and improved NIST library based identification. 2. S. E. Stein and D. R. Scott, "Optimization and testing of mass spectral library search algorithms for compound identification" J. Am. Soc. Mass Spectrom. 1994, 5, 859-866. 3. S. E. Stein, "An integrated method for spectrum extraction and compound identification from gas chromatography/mass spectrometry data", J. Am. Soc. Mass Spectrom. 1999, 10, 770-781. 4. A. Amirav, "Electron Impact and Surface Ionization Mass Spectrometry in Supersonic Molecular Beams". Org. Mass. Spectrom. 1991 26, 1-17. 5. A. Amirav, A. Gordin, M. Poliak, A. B. Fialkov. "Gas Chromatography Mass Spectrometry with Supersonic Molecular Beams". J. Mass Spectrom. 2008, 43, 141-163. 6. S. Dagan and A. Amirav, "Electron Impact Mass Spectrometry of Alkanes in Supersonic Molecular Beams". J. Am. Soc. Mass. Spectrom. 1995, 6, 120-131. 7. M. Kochman, A. Gordin, P. Goldshlag, S. J. Lehotay, A. Amirav, "Fast, High-Sensitivity, Multi-Pesticide Analysis of Complex Mixtures with Supersonic Gas Chromatography–Mass Spectrometry". J. Chromatog. A. 2002, 974, 185-212. 9. T. Alon and A. Amirav “Isotope Abundance Analysis Method and Software for Improved Sample Identification with the Supersonic GC-MS”. Rapid Commun. Mass Spectrom. 2006, 20, 2579-2588. 11. A. Gordin, A. Amirav and A. B. Fialkov "Classical Electron Ionization Mass Spectra with GC-MS with Supersonic Molecular Beams" Rapid. Commun. Mass Spectrom. 2008, 22, 2660-2666.